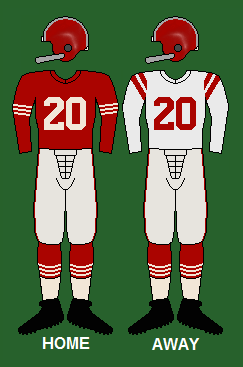 The 1954 San Francisco 49ers season was the team's fifth season in the National Football League (NFL), and it was coming off a 9–3–0 record in 1953, finishing one game behind the Detroit Lions for a spot in the championship game. The 49ers would get off to a strong start, beginning the season with a 4–0–1 record, as they were trying to finish on top of the conference for the 1st time in team history. The Niners would lose their next 2 games against the Chicago Bears and Los Angeles Rams by close scores, however, they still found themselves in the playoff race as no team was running away with the conference. The 4–2–1 Niners had a huge game against the 5–1–0 Detroit Lions, which was a must-win game for San Francisco. The Lions though had other ideas, demolishing the 49ers 48–7, as they fell to a 4–3–1 record. San Francisco would finish the season with 3 wins in their final 4 games, and finished the year in 3rd place with a 7–4–1 record. Offensively, Y.A. Tittle had another strong season, throwing for 2,205 yards and 9 touchdowns, while completing 57.6% of his passes. Billy Wilson led the club with 60 receptions and 830 yards and 5 touchdowns. San Francisco's ground attack was overwhelming. Joe Perry rushed for an NFL high 1,049 yards, and John Johnson rushed for 681 yards (2nd highest total in the NFL) and a team high 9 touchdowns. Hugh McElhenny was leading the team with 8.0 yards per carry until he separated his shoulder on October 31 against the Chicago Bears. Joe Perry (FB), Bruno Banducci (G) and Leo Nomellini (DT) made the Associated Press All-Pro team. Hugh McElhenny (HB), Billy Wilson (E), and Bob St. Clair (T) made the second squad.